Syntax coloring has been introduced in Qedit for Windows 5.3. Each language supported is defined in its own language template file. Language template files are simple XML files stored as text. This means it's easy to create new templates or customize existing ones. Qedit for Windows comes with a series of templates defining many languages commonly found in HP3000 and HP9000 environments. This article shows how to customize one of these templates, namely SPL. Robelle-supplied templates are stored in the system/language subdirectory where Qedit for Windows is installed. 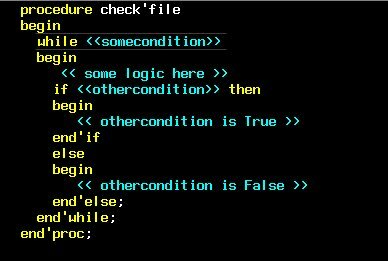 Typically, this would be c:\robelle\qedit\system\language. You should not change these files since they will be replaced next time you install a new version of Qedit for Windows. You should make a copy of the files you want to customize into \robelle\qedit\user\language or into one of your own directories. This rule also applies to a new template that you create. In a previous article, we have explained how to customize a language template to fit your Qedit for Windows environment. Today, we will show you how to add Suprtool commands to an existing language template. 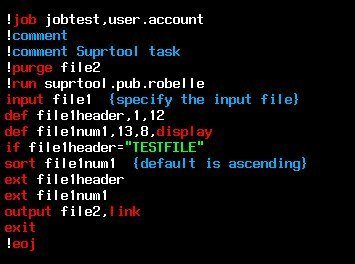 Typically, Suprtool commands are embedded in job streams among MPE commands. These job streams are usually JOB files so the corresponding language would be job.xml. The standard JOB language template that is distributed with Qedit for Windows only contains MPE commands. If you work a lot with Suprtool, it is nice to have its commands highlighted as well. We have put together an add-on file which contains everything you need. The file is regular text file called suprtoolkeywords.txt. Here's what you need to do to update the JOB language template. Note: you can customize the language template of your choice. It doesn't have to be this one. Download suprtoolkeywords.txt to your PC. Open the language template file with your favorite editor. The template files are usually stored in the \robelle\qedit\system\language directory (the default install directory). Open the Suprtool keyword file. Select the comment lines and copy them to the clipboard. Go back to the language template and paste these lines in the Comments section. They can be pasted anywhere between the Comments and /Comments XML tags. Go to the Suprtool keyword file, select all the Keyword lines and copy them to the clipboard. Go back to the language template and paste these lines with the other Keyword entries. They can be pasted anywhere (before, in between or after). If you have used Qedit for Windows to edit the files, you have to exit and restart it.